written by William "Bill" Lellis, Larkspur Fire Chief, retired. (left-right) Ron, Irene, Virginia, and father Rudy Nelson in 1957 in Larkspur. If you have three to four good friends in your life, you are truly blessed. Recently I lost one of those true friends. 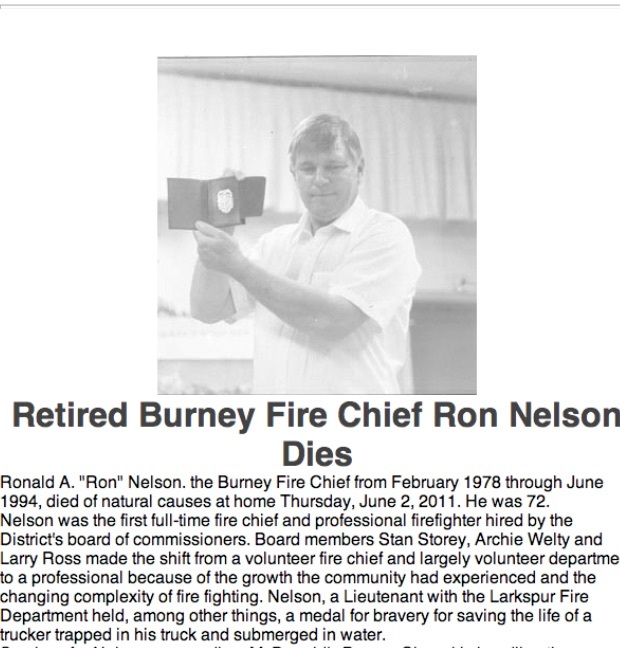 On June 2, 2011, we lost Burney Fire Chief Ron Nelson. Ron and I were friends for over 50 years. We first met in 1958, when Ron was serving aboard the U.S.S. Hamner, where he was a Machinist Mate. I was a volunteer fireman/sleeper with the Larkspur Fire Department. To say our first encounter was cordial would be stretching the point. To describe Ron’s mannerisms, we would need to visit Ebenezer Scrooge on Christmas Eve, when the grumpy man goes to sleep. But once you understood Ron, he was really instead the changed Ebenezer on Christmas morning, when he flings open the window and tells the lad in the street below to go and buy the goose in the butcher ‘s window for his nephew’s Christmas dinner. Ron was a very caring and very, very funny guy. I always looked forward to his phone calls, because I knew I would hear some great jokes. He enjoyed telling them as much as I did hearing them. So the last 50 years of friendship were wonderful. Ron was born in Larkspur, California, on Feb 25th, 1939. Ron’s dad Rudy Nelson was a projectionist, working in theaters throughout Marin County. Rudy enjoyed taking home movies, many of which included scenes from Larkspur, and some of are posted in the Larkspur FD section on this history web site. Ron attended Larkspur-Corte Madera grammar school (LCM), and went on to graduate from Drake High School in 1957. Like many young men of the time, if you were lucky you went on to college. If college was not part of your future, the U.S. military was an honest option. 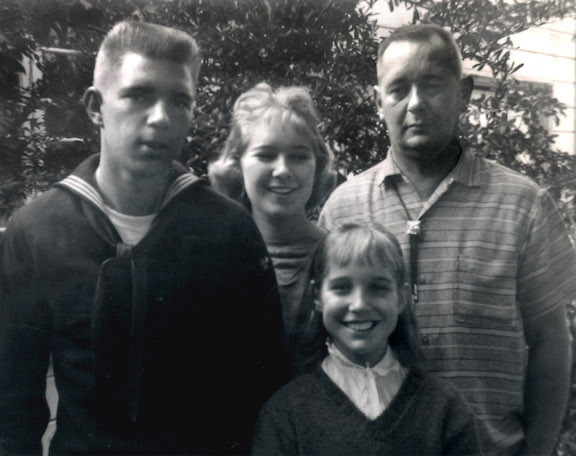 So, in the fall of 1957 Ron joined the U.S. Navy, and after serving a four year stint, he was honorably discharged. As a child growing up in Larkspur, his best friend and next door neighbor was Ranger Benz, whose dad Walt was a member of the Larkspur Volunteer Fire Department. So it was natural for these two boys to hang out and play around the fire house. After leaving the Navy, Ron found a job with the Alto-Richardson Bay Fire Department, under the tutelage of Alto Fire Chief Carl Heynen, a master machinist. Ron would learn how to build a fire truck from the bottom-up. It was common for the Alto fire department to build their own apparatus from old ‘hand me down’ trucks or surplus rigs. On his off days Ron hung around the Larkspur Fire Department, so when the opportunity presented itself Ron was hired and became a member of the Larkspur Fire Department. Ron attended the College of Marin Fire Science program and before you knew it, he was promoted to the rank of Lieutenant, assigned to Larkspur Station Two at 15 South Eliseo Dr. in Greenbrae. The two-man station was supported by four volunteer sleepers, or resident firemen. There was a creek about 20 feet from the rear of the station, and many a time, when the tide was high and the creek was full to the brim, Ron and I would ask a sleeper to catch the emergency phones. Without hesitation, we would be swimming in the middle of the creek, clothes and all. It was a sad day when the city replaced the creek with an eight-foot pipe out to the main creek, to make way for a future road. The stations’s dormitory was open with very little privacy. It a was six-bed station; two for the paid staff and four for the sleepers, which was always full. Ron would play an important part in the development of these future firefighters. Many went on to have stellar careers in the fire service, including such individuals as Pat Williams of Ross Valley FPD, Tom Forster, Chief of Skywalker Ranch FD, and a cousin of Ron’s; Matt Gustafson, Battalion Chief/ Fire Marshal of Windsor/Central County FPD, Robert Sinnott, retired Chief of Larkspur, and now Deputy Chief of San Rafael FD; and Jim Buscher, former paid Larkspur firefighter, who went on to complete his career with the Louisville Kentucky FD, now retired and operating a fire investigation business. These are just a few of the men whose lives Ron influenced. While on a company safety inspection at Rich Ready Mix Concrete in Greenbrae, Ron would meet the love of his life, a secretary/bookkeeper named Evalee. I remember when Ron came back from the inspection, he talked about about asking her out, and asked what I thought about it. My reply was if she had no "code violations", I guess it would be OK. So began a 36-year love affair with his wife, Evalee. Ron had two daughters, Lori and Kim. Ron and Evalee also adopted a third daughter, Denice. 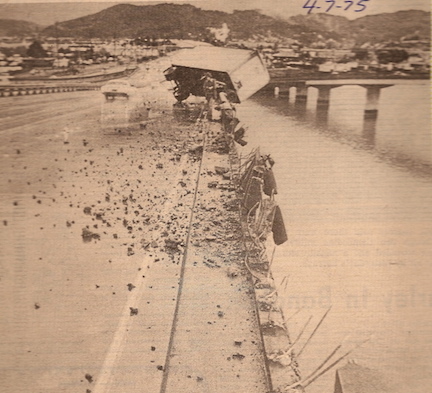 On April 7,1975 ,at 7:00 pm the area was experiencing a torrential rain storm, and within moments Ron Nelson would be tested beyond his wildest imagination. Up on Highway 101, a semi-truck driver hauling two trailers southbound for San Francisco was having difficulty removing the rain from the windshield. As the rig approached the bridge that spans the Corte Madera Creek, the driver applied the brakes and there was no response. The truck and trailers hydroplaned out of control; taking 40 feet of guard rail out. The tractor and first trailer left the bridge and plunged 50 feet into the swollen, fast moving, and cold Corte Madera Creek. Back at the Greenbrae fire station the alert tones sounded, telling Ron that a truck had left the highway and was in the creek. The incident location was less than a minute away, and as the engine turned onto Sir France Drake Blvd., the entire scene could be observed: the second trailer hanging over the bridge, with the top of the lead trailer and the exhaust pipe of the cab was all that could be seen in the creek. Ron had his firefighter engineer turn into the first driveway that would take him to the bank of the creek. In a side compartment Ron reached for a softball size emergency life ring that, upon impact with the water would open up into a small life ring. With a mighty throw it came close to the cabs location and without hesitation, Lt. Nelson dove into the cold, fast moving waters of the creek. Within moments Ron was alongside the cab, where he found the semi-conscious driver clinging to a piece of foam that happened to pass his location. Ron immediately put the life ring around the driver, and began to swim and pull him towards the shore. During their journey to shore, the driver asked Ron if he could go back and look for his upper denture plate - the teeth were never found. For his actions, Ron would receive the California State Firefighters Association (CSFA) Valor Award for heroism. In 1978, Ron and his wife Evalee would leave his home town of Larkspur to accept the Fire Chief position in Burney, California. He would be the first paid chief in the town, a rural community east of Redding in the northern Sierra Nevada Mountains. Ron had a staff of three paid firefighters, 20 volunteers, and two stations. The second station, located in Johnson Park, was no more than a large garage with a very old fire engine. In addition to the fire department, the fire station also housed the area EMT’s and ambulance. A group that, to say the least, were very independent to directions. The ambulance district covered over 300 square miles, with the closest hospital being 50 miles away in Redding. Most runs took over two to three hours total. Ron would serve the citizens of Burney with distinction for sixteen years, retiring on June 24,1994. Ron’s second love was his model train collection, which took up his entire garage and was always under construction, always trying to get it just right. For example, while on vacation in Hawaii, we came across a black sand beach, and thinking quickly, Ron had our wives collect two baggies of this sand so he could use it in his coal cars behind his locomotive. This was in the National Park, so if the ladies were caught they would go to jail, not him. The beach now lays under six feet of new lava, so the evidence has been destroyed. Ron was a member of the "Los Angeles Live Steamers", a model train association in Southern California. He would spend weeks at a time explaining trains to the next generation of collectors throughout California. Ron truly loved sharing his knowledge of trains with children. I will close with an incident that happened to me the day before his memorial. My wife and I were on our way back to Burney after visiting Lassen National Park. We were approaching the community of Old Station when I noticed a lonely old fire engine in a meadow. I wondered to myself how old this engine was, and where it was from, and said to myself, “ I’ll ask Ron when we get back to town” - for that brief moment I forgot Ron was gone. Aristotle observed : "What is a friend? A single soul, dwelling in two bodies"
The second trailer hung above the creek, while the tractor and first trailer crashed through the guard rail into the rain swollen and fast moving creek below. 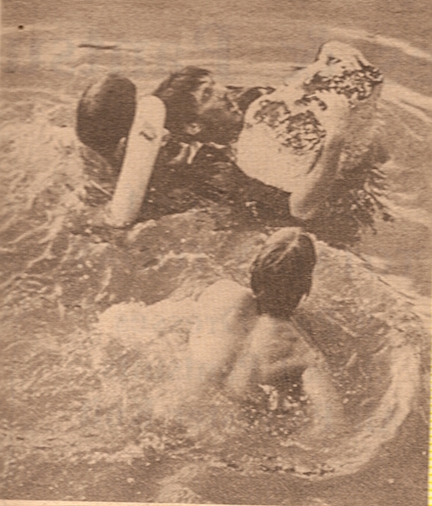 34-year old Petaluma resident and truck driver John May was rescued by Lt. Ron Nelson, assisted midway on the swim to shore by ambulance attendant Michael Bernier (without shirt). John May was listed in satisfactory condition that night at Kaiser Hospital with facial bruises and minor burns. The tractor and trailer sank into the creek, and was later removed. 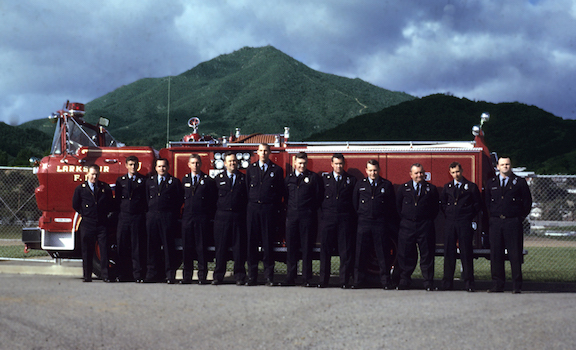 The paid staff of the Larkspur FD in 1967. Ron Nelson is pictured fourth from the left. Author William Lellis is at far right. 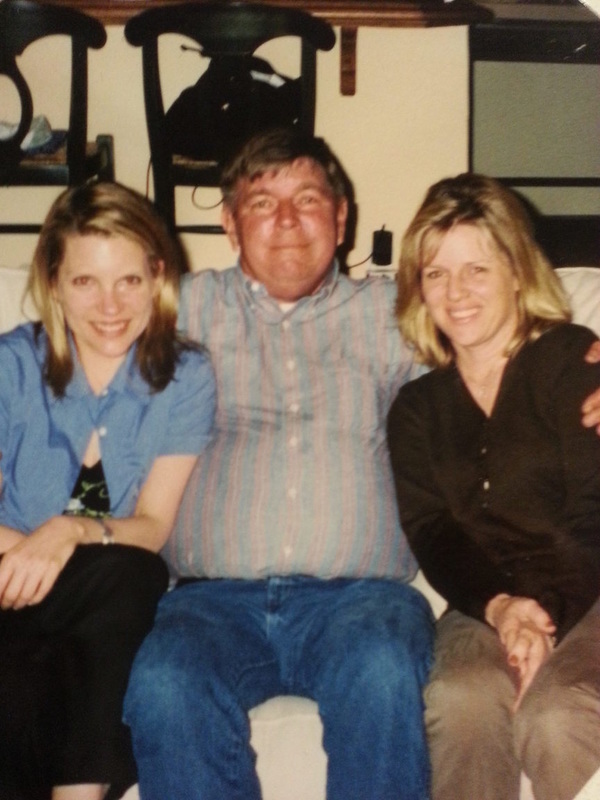 Ron with his two daughters, Kim on the left, and Lori on the right. Both would go on to work for Lucasfilm Ltd. at Industrial Light and Magic, and later in Hollywood in the film industry.